The Books that got me into baking…And Still enjoy! Every time I go to my bookshelf to look for something quite specific, I always annoy myself at just HOW MANY cookery cooks I actually have to peel from the shelves and onto the floor to get to the one that I need! This exercise is never a short one either…the book that I am looking for is most usually right at the bottom towards the back, and my living room ends up looking like Beirut within the space of approx 2 minutes! I am sure that other cooks (Professional and home makers alike!) will all be nodding in agreement with me here! I can’t be the only one that suffers this unorganised state!!!???….. This weekend, whilst looking for one specific recipe within one specific book….I stopped and looked at just how many cookery books I actually owned and felt ashamed for a moment, as I didn’t feel that I use them very often. And with the Mister watching silently, I could feel his cookery-book-hoarding judgement from the opposite side of the coffee table! So I guiltily sat back and thought about each and every book, and as I decided which ones might need to go, I realised something……. …… I do use them all! !….several times over throughout the past ten or so years that I have enjoyed baking! I may not use loads of recipes from each one, but I do actually and have used every single book many times over, and I intend to for many many times in the future! …… Perhaps you will recognise them all!….Perhaps you won’t! All I will say is that I have had a HUGE amount of fun baking with these books, and I love them all!…Of course, mainly for their sweet dishes! hehe. First Up…Nigella!…. Who doesn’t like the Domestic Goddess herself?! Ok….Well, I do know of many who do NOT like her, but I think she is FAB! She has been a real role model for my younger self, and I looked up to her a lot and loved just how glamourous she looked whilst cooking!….IF ONLY I could look as glamourous with scone mix wiped over my face….she is Fabulous! The Patisseries Of Paris… a book that was reccomended through Edd Kimber’s Blog (The Lovely Edd won The Great British Bake Off on BBC1 in 2010) and has inspired me over the past few months to enjoy a class or two at the LOVELY Cambridge Cookery School, where I have started to learn how to make various French treats, and I feel inspired to visit Paris not too far into the future thanks to this dreamy book! Who You Callin’ Cupcake? – A book that had grabbed my attention on play.com and had added to my Xmas wish list for some American inspiration. Hmm….Having made the vanilla cupcakes….I am not entirely sure that this is a great recipe book….I will try again, but they came out very much like doughnuts!…Crispy on the outside and nothing in the middle!.. But for decoration ideas, this book is tip top! I Love staring at the designs! The Brownie Cookbook – My very FIRST cook book. 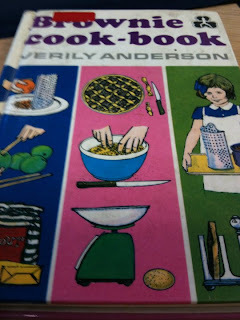 Having offered to help out my pack with a jumble sale, I came across this book and liked the sound of cooking safely without my mum!….So I stashed it under my coat, stuck 20p in the pot and hoped nobody would see that I hadn’t put it out for sale!….To this day!….I still use it! The flapjack recipe was the first recipe I had made alone, and it went down a lot better than my “Teddy Bears Birthday Cake” which was disappointingly just a jam sandwich covered in buttercream….ick! Good Old Delia! She, I am sure, is the oracle for most home cooks and bakers un the UK, and she has gotten both Myself AND the Mister out of some very dodgy kitchen situations such as the roast potatoes that we decided to cook with Goose Fat for our first Xmas dinner…But had no idea how to actually do it….it was easy in the end!….And saving my bacon when I had drawn a complete blank on how to actually make a traditional Yorkshire Pudding! The woman is a GEM to be held in the Kitchen! The Hummingbird Bakery is still somewhere that I have not yet had the chance to visit, but I was given this book for a gift one year, and it makes some of the MOST delicious cupcakes I have ever made! Very simple and yet extremely tasty recipes! I have not yet ventured away from their cupcakes….so right now I feel inspired to go away and try out one of their scrummy-looking traybakes!! – A must have book for any cupcake fan! The Hairy Bikers have produced some brilliant cook books, but their “Mums know best” book is a favourite of mine, used many many weeks of the year! – I have used various versions of their recipes for The Secluded Tea Party so far, and they have all gone down a storm! Easy to prepare recipes, and very easy to follow!… If you don’t use them, give them a go….they offer no nonsense, really well thought out recipes! Check out the cheeky chaps here! Ravinder Bhogal is a new one on me… I hadn’t heard of her until my auntie gave me Cook in Boots as a gift! Now, I am not one for experimenting in other lands of wonderment, OTHER than with British Food really! – I am a bit of a wuss when it comes to Indian food….however, the lovely lady makes THE MOST tasty guilty pleasure in the form of a pan-cooked Banana and Chocolate Sandwich! YUM. Worth owning this book JUST for this recipe alone! Hehe. And Lastly…Of course…The QUEEN of baking! Mary Berry’s Fool proof Cakes. This was my first real cake book, where I made my first REAL Victoria Sponge, and various other firsts too! This book is so simple, yet so satisfying. Mary Berry has a way of writing that makes it easy to follow and makes you want to get it right, just in case she ever KNEW that you hadn’t done exactly what she had told you to do! I love her, and I love this book!